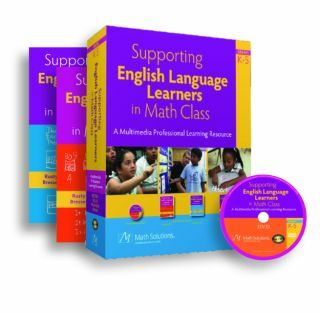 Supporting English Language Learners in Math Class was developed for mainstream classrooms with one or more ELL students and includes three main components: a DVD of teachers and students in action, a two-book series for grades K–2 and 3–5, and a facilitator’s guide that supports widespread implementation of effective strategies. Supporting English Language Learners in Math Class was developed for mainstream classrooms with one or more ELL students and includes three main components: a DVD of teachers and students in action, a two-book series for grades K–2 and 3–5, and a facilitator’s guide that supports widespread implementation of effective strategies. ? Pros: The DVD and the books show real teachers interacting with real students. From this the end user will be able to gain insight into how to apply these ideas in his own classroom to help non–English-speaking math students comprehend math concepts. Cons: Other than the DVD, there is not a lot of technology in this product. Most of the information is in the two books included in the box with the DVD. Overall evaluation: The large amount of information in the books makes this product a good value. The material is explained in such a way that even the educator who is not proficient in math can understand and apply it in his own classroom.